In this example we are reviewing the Georgia Examination Content Outline which shows how many questions are on the insurance exam for a specific section. 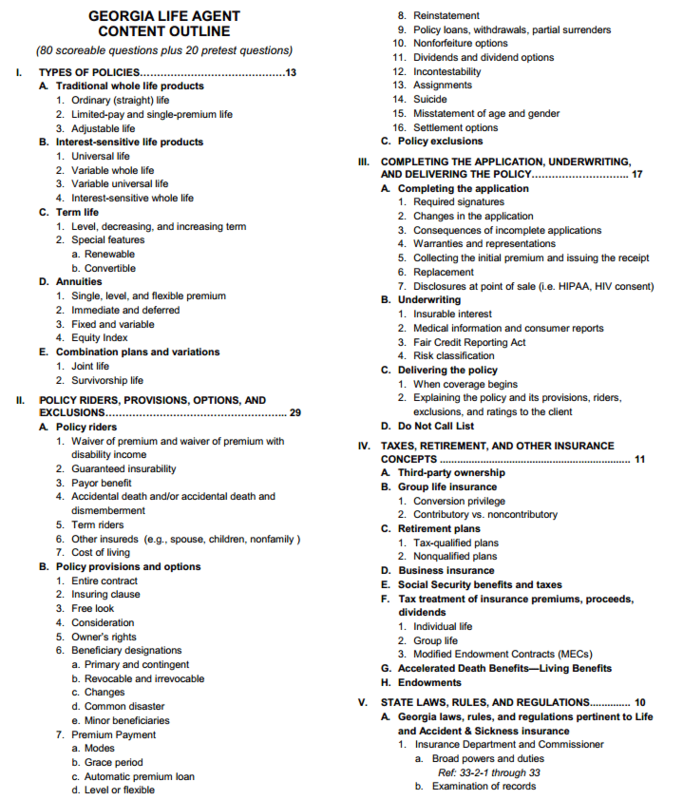 As you will notice, Section I – Types of Policies – has a total of 13 questions on the state exam. Section II – Policy Riders, Provisions, Options, and Exclusions – has a total of 29 questions on the state exam. While concepts and topics listed in each section are important to understand in preparing for the insurance exam, Section II has twice as many questions than Section I, which implies it requires twice the amount of study time. In this example, we are reviewing the Pennsylvania Examination Content Outline which shows the importance of a specific section based on its percentage of coverage on the state exam. 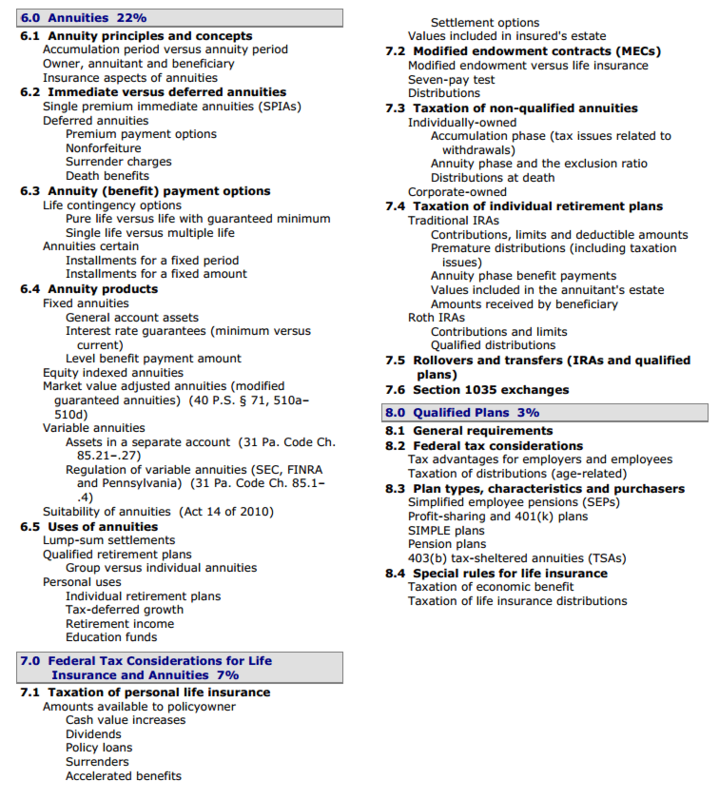 This outline shows that Section 6 – Annuities, which totals 22% of the exam, has 7 times as many questions as Section 8 – Qualified Plans, which only accounts for 3% of the total number of questions on the exam. National Online Insurance School helps streamline the process of preparing for your insurance exam by including a feature we call Pass Report, which displays both the amount of time you study in each lesson, as well as the amount of time we suggest studying to fully comprehend the concepts taught within each lesson. The suggested time listed for each lesson is relative to the respective section found on the Examination Content Outline, taking the guesswork out of the correct amount of time you should be studying. You may view your state’s Exam Content Outline at our Insurance Exam Requirements page. What do you think? Did you use the Exam Content Outline in preparation for your state insurance exam? Share your experience by leaving a comment below!